The Bank of New York Mellon Corp. (NYSE: BK) reported a 20% dip in earnings for the first quarter of 2019 due to the changing mix and cost of its deposits as well as the impact of the prior year asset management outflows. The results missed analysts’ expectations. Net income applicable to common shareholders dropped by 20% to $910 million and earnings fell by 15% to $0.94 per share. Total revenue declined by 7% to $3.9 billion, due to a decline in fee revenue and lower net interest revenue. Net interest revenue decreased by 8% due to lower noninterest-bearing deposit and loan balances, higher deposit rates and hedging activities. Fee revenue dropped by 9% due to the negative impact of foreign currency translation, the 2018 divestitures in Asset Management and asset-related gains recorded in the first quarter of 2018. The rest of the decrease in the fee revenue reflected the impact of the cumulative AUM outflows since 1Q18 and lower foreign exchange revenue, client activity and performance fees. 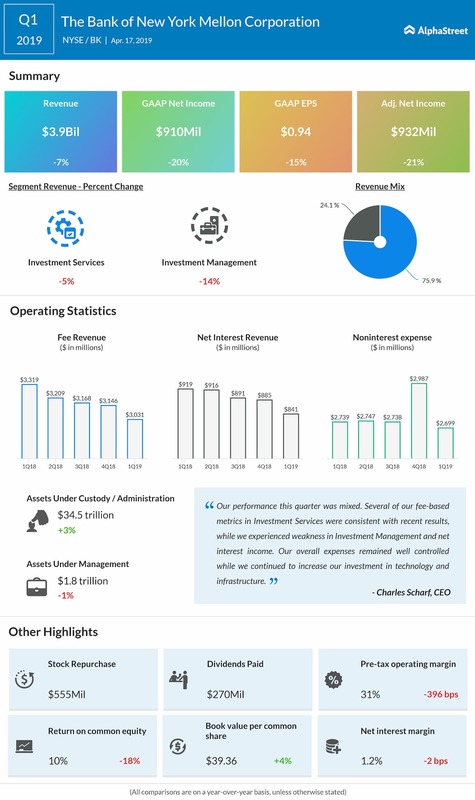 For the first quarter, revenue from Investment Services declined by 5% year-over-year due to lower foreign exchange revenue, lower deposits, lower client activity, lost business, lower clearance volumes, lower fees in depositary receipts, and lower net interest revenue. Revenue from Investment Management inched down by 14% due to the impact of the 2018 divestitures and the unfavorable impact of a stronger US dollar, as well as the impact of the cumulative asset under management outflows since 1Q18 and lower performance fees. Assets under custody and/or administration increased by 3% to $34.5 trillion, primarily reflecting higher market values and net new business, partially offset by the unfavorable impact of a stronger US dollar. Assets under management declined by 1% to $1.8 trillion due to the unfavorable impact of a stronger US dollar (principally versus the British pound) and net outflows, partially offset by higher market values. While the current expectations for the yield curve will likely negatively impact its revenue growth for the next several quarters, the company will remain disciplined on expenses and continue to build out capabilities, which should eventually enable stronger growth. Shares of Bank of New York Mellon ended Tuesday’s regular session up 1.60% at $53.44 on the NYSE. Following the earnings release, the stock inched down over 4% in the pre-market session.